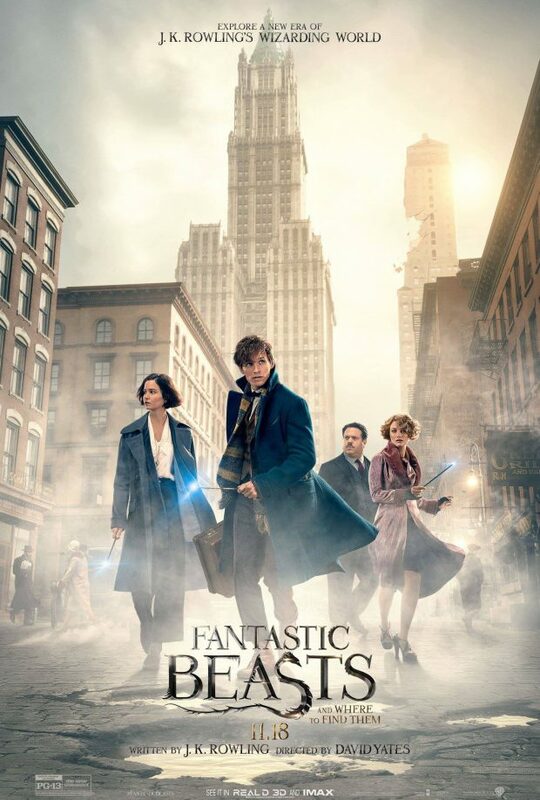 The Harry Potter franchise expands with Datvid Yates’ Fantastic Beasts and Where to Find Them. Newt Scamander (Eddie Redmayne) is the author of a textbook featured in previous Harry Potter adventures so his story is really good fodder for a prequel/spin-off explaining how he came about that knowledge and detailing the experiences he had gathering the information. This is the biggest opportunity that this film misses as we meet Newt when he already has that knowledge and is working on the book that will make him famous. With this starting point there really isn’t anywhere for him to go as a character since everything we know about him is already in his past. Newt is an incredibly static character as a result and doesn’t go through anything resembling an arc or show any real emotional depth in the film at all. Eddie Redmayne is a good actor but that means he doesn’t have much to work with beyond being really quirky and awkwardly British around all of the American characters. Other characters are a mixed bag but more or less come across well. The strongest is Jacob Kowalski (Dan Fogler), a normal human -or Muggle as UK Wizards call them; No-Maj as US Wizards call them- who gets sucked into the magical madness after trying to get a small business loan from the bank. He’s the audience perspective but his contribution doesn’t end there. In many ways he’s the heart of the film while also being the comic relief. It would be easy for this to be annoying but it never is as he’s such an endearing character played with lots of sincerity by Dan Fogler. Also along for the ride is Tina (Katherine Waterston) who sort of serves as Newt’s love interest but thankfully this isn’t given a lot of attention. For the most part her role involves her trying to rebuild her reputation as an Auror -Magical Police- after she has been somewhat disgraced. She’s a driven and caring person who likes to get to the truth of the situation. Waterston is great in the role and has plenty of opportunity to add depth to Tina. Her sister Queenie (Alison Sudol) is someone I found far more interesting. She’s a psychic so her ability to read minds gives her a natural empathy for everyone she meets. Sudol and Fogler have such natural chemistry which makes the connection between them work really well. Sadly Queenie isn’t featured all that heavily and there’s a lack of variety in how she contributes to the film but her presence is a memorable one all the same. A huge problem this film has is that there isn’t really a cohesive story. There are a lot of random subplots that take place at the same time to give the illusion of a story which is funny considering this is a film about magic come to think of it. The bulk of the film is take up by Newt trying to round up some escaped creatures that were let out of his briefcase. This almost feels like a story but in reality it’s a series of encounters designed to showcase some really impressive creature design and creative visuals but as stories go it doesn’t qualify as far as I’m concerned. Another narrative is to do with the divide between the magical and human communities with some mention of how that happened and the length of time it has endured. There is some noise about it not working for everyone and change being on the horizon. This was a great idea and an entire film could have been hung on that premise but it comes across as a frustrating afterthought to pad out the last 20 minutes or so. Colin Farrell’s Graves could have been the focus for this but feels like he’s in a different film instead. The film isn’t bad as such but the lack of focus makes it a very strange watch. I did actually enjoy a lot of it but the problems really stood out at me. It was an impressive visual feast from beginning to end and it was interesting to take a look at another part of the Harry Potter Universe. Another thing in its favour is that it is a stand-alone experience that doesn’t rely on having seen or read anything to do with Harry Potter. There are a handful of references I picked out and possibly even more that I missed due to not being in the fandom but other than that this can be viewed in isolation and it proves that there is a lot of potential for storytelling in this universe. I just wish that there had been a cohesive story and a character arc for Newt to help carry this film. An enjoyable experience with a lot of flaws that drag it down. Newt arrives fully formed which means there isn’t really anywhere for him to go so character development for him is minimal. Jacob is a great character who takes on the role of the audience perspective as well as both the heart and humour of the film. He’s endearing and has a believable connection with Queenie. Tina is also an interesting character who is well acted and has a solid arc throughout. The story is problematic as it is basically a collection of subplots posing as a story with much of the film being a repetitive monster hunt. It is a visual feast with really creative creature designs and entertaining sequences but I wish the film had actually been about something.